Not all plastic, just the bottom half again. Great new review. Thanks for the closer look. 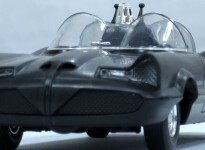 When will we see a pimped out batmobile? I’m bothered by the blatant omission of cherise red trim on the leading edge of the hood (above the parking light locations). What’s up with that?